Product code: 10050 Categories: The Beach, Bangles and Bracelets. 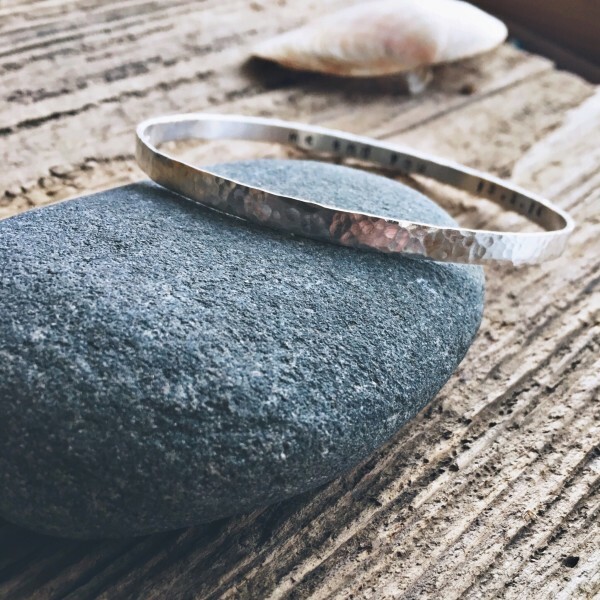 The hammered bangle is handmade from recycled silver, 1.20mm deep and 4mm wide, using traditional tools and techniques. 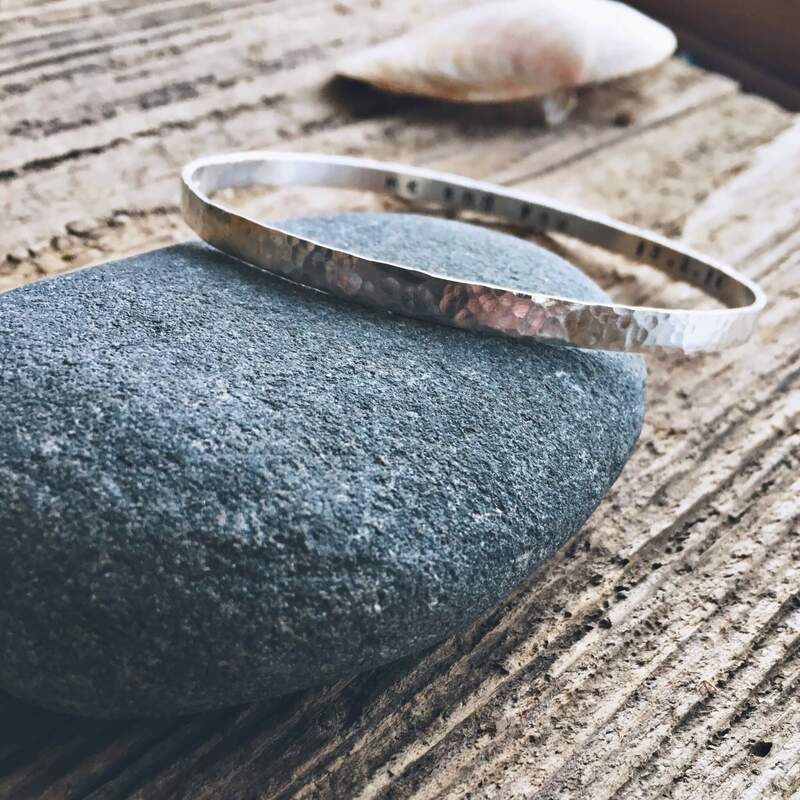 The bangle is hammered to give a beautiful light reflecting surface. It can be hand stamped on the inside with a secret message of your choice. The secret message can be either names of loved ones, or a special date. It can be a motivational message or perhaps a line from your favourite poem or song, any secret message you would like. Your message can be up to 60 characters long, to include spaces. 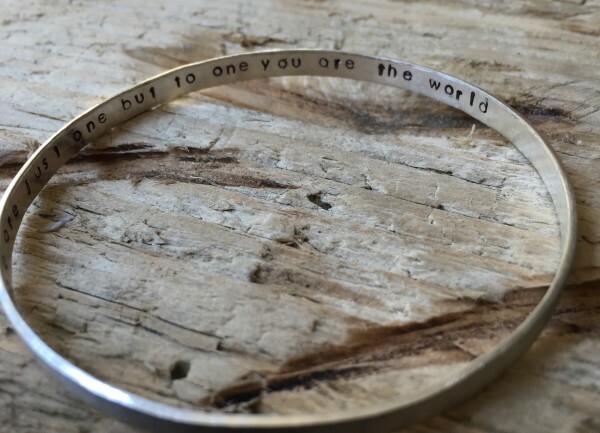 The personalisation makes this bangle totally unique to you. These bangles make beautiful gift for a bride on her wedding day, with a secret message only you and she know about! They make unique bridesmaids gifts, perfect personalised gifts for the mother of the bride and are a lovely gift for a special birthday. Your bangle will be made to order and can be made as small (19-20cm circumference), medium (20-21cm circumference) or large (21-22cm circumference). If you would like any other size please contact me, I’m always happy to make something to your requirements. Please note that the messages are hand stamped and not engraved, any irregularities are part of the bespoke nature of the item. Please let me know in the notes at checkout the message you would like in your bangle. Please allow three to four weeks for me to make your bangle.